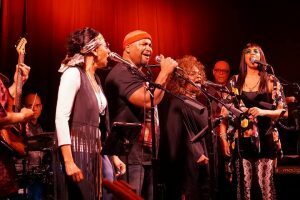 This weekend, Columbus’ all-star Sly and the Family Stone Tribute Band will perform its annual two night tribute to the music of the legendary Sly Stone and his groundbreaking band. Sly and the Family Stone Tribute Band presents “It’s A Family Affair: A Tribute to the Music of Sly & the Family Stone” at Natalie’s on Friday, March 23rd at 10pm and Saturday, March 24th at 10pm. Tickets are going fast, with more available for Friday (click here) than for Saturday (click here) at press time. More details from Natalie’s: “The Tribute Band will feature singers Vicki Saunders, Debra James Tucker, Tia Harris, Dolly King, and Ron Jenkins backed by the brilliant sounds of the Urban Jazz Coalition. There will be a number of very special guests, along with a video slideshow and Birthday cake to celebrate Sly’s Birthday, which is March 15! Throw on some funky 70’s clothes and win a Natalie’s Gift Card each night for being the best dressed and most spirited! Most of all, come out to dance and have fun celebrating Sly’s uplifting music performed by this outstanding band that will take you higher and higher!” Saunders’ video of last year’s performance is below – Get ready for two fun and funky nights!